This course begins the journey into more “extreme” diving and takes experienced and qualified divers far deeper than in mainstream Recreational diving. Extended Range Nitrox provides recreational divers an opportunity to gain exposure to technical diving and learn and practice entry level technical diving skills. Extended Range Nitrox dive scope is within recreational limits, and qualifies divers to make limited, single gas decompression dives of no more than 10 minutes deco to 40m/130ft. 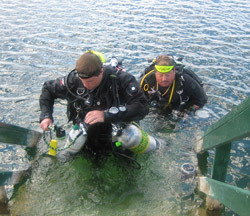 Divers use air and up to 50% nitrox. Use decompression software and dive computers to plan and make decompression dives with no more than 10 minutes of total decompression and not deeper than 40 meters/130 feet. Enriched Air Nitrox 40% or qualifying prerequisite certification. Double cylinders with dual manifold and decompression cylinder will be supplied. Harness with back plate with shoulder and rigid hip D-rings. To the Extended Range course.